The effects of the use of such honey may have important dental health implications in terms of prevention of dental caries, especially in children. There is a relative paucity of studies in the dental literature in this regard, Hence, the present study was carried out to determine whether manuka honey with known antibacterial activity rated UMF = 19.5 [Figure 1] and [Figure 2] would be effective in reducing salivary levels of mutans streptococci in children. At least one decayed tooth present. Subjects adhering to twice daily tooth brushing routine (using toothbrush and non-fluoridated toothpaste) and practicing no other oral hygiene measures, either professional or home-based, other than the requisites of the research project. No history of antibiotic usage during the past one month. No abscess, draining sinus, cellulitis, or other conditions requiring emergency dental treatment. Participant co-operation and acceptance of the treatment regimen. No medical/hereditary condition or long term/recent/current regimen of medication that can affect salivary flow or necessitate diet modification. No history of adverse reactions to honey. All school children in the age group of 9-12 years were examined using oral health survey forms, and 30 children were selected based on the selection criteria. Since it was a residential school for boys, female children could not be selected for the present study. 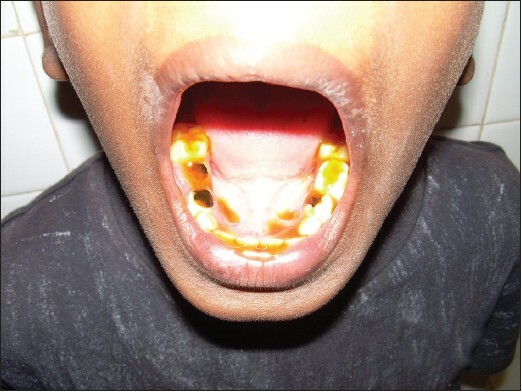 The numbers of decayed, missing, and filled surfaces of primary and permanent teeth (dmfs/DMFS) for each child were recorded by a single trained examiner by using portable dental operatories and accepted methods of infection control, according to WHO diagnostic criteria for dental caries. Verbal consent from children and signed consent forms from parents or guardians were obtained after the nature of the study was fully explained. Approval from the concerned institutional ethics committee was obtained for the study. Five milliliters manuka honey (UMF 19.5) loaded in a sterile 5-ml syringe (devoid of needle) was deposited on the coronal surfaces of all erupted teeth and the dorsum of the subject's tongue [Figure 3], [Figure 4], [Figure 5]. A trained assistant performed the procedure on all the subjects of this group twice daily-after breakfast in the morning and after dinner-for a 21-day period. After application, the subjects were instructed to hold the honey in the mouth and not swallow it for one minute; they were then asked to expectorate the accumulated saliva and honey at the end of one minute, and not to eat/drink/rinse for 30 minutes thereafter. The subjects of this group performed no treatment regimen other than their normal twice-daily tooth brushing routine. Three clinical examinations-on day 2, day 10, and day 21-were incorporated into the study design wherein the subjects were questioned and an intra-oral examination was performed to detect any adverse, allergic, or unusual reactions such as desquamation or unpleasant taste. 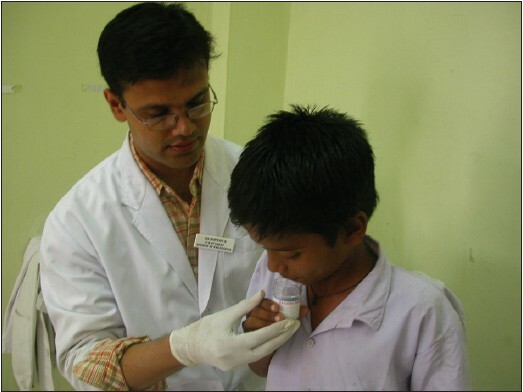 Clinical assessments were performed at the residential school by a single examiner using portable dental operatories and accepted methods of infection control. An assistant coded the study subjects from 1-30 before clinical examination and saliva collection by the examiner to ensure that at no time was the examiner aware of the group assignment of any subject. The data was later decoded at the end of the investigation. 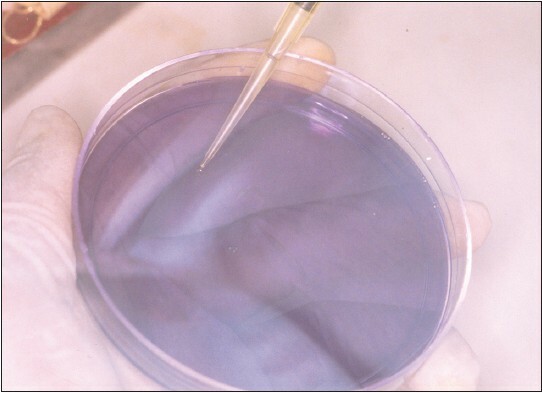 Saliva samples were obtained from each individual initially prior to the start of the experiment to establish baseline mutans streptococci levels. 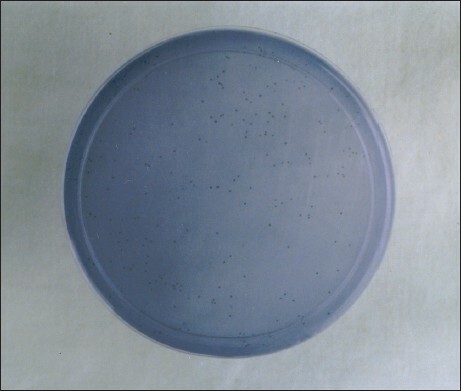 Subsequent samples were obtained on day 10 and day 21, after the start of the experiment [Figure 6]. Samplings were performed unannounced in order to minimize participation effect. 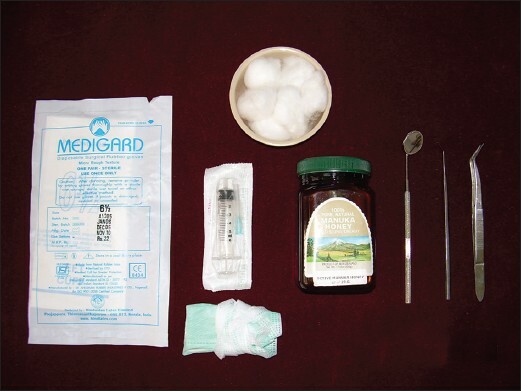 At each sampling, paraffin-stimulated whole saliva samples were collected in sterile bottles in the mid-morning with no eating/drinking for two hours prior to the sampling. The child was asked to chew a piece of paraffin wax for two minutes after which the child expectorated the accumulated saliva into the sterile bottle. 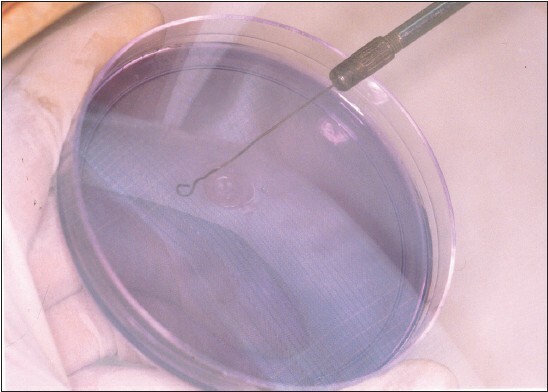 No transport medium was used as culturing was done within half an hour of collection of samples. 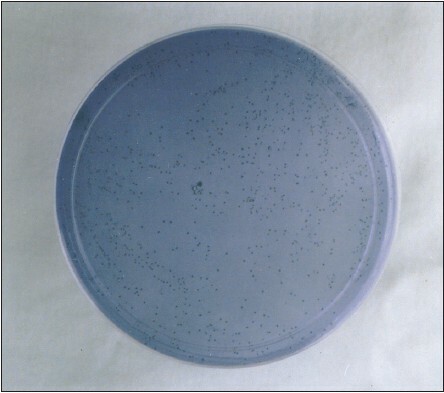 The samples were then subjected to microbiological analysis. All data was entered into a database on Microsoft Excel and analyzed using SPSS software with two-way ANOVA (for overall group mean comparisons), Paired T-test (for intra group comparison of differences between baseline, day 10, and day 21 examinations for salivary mutans streptococci counts) and Wilcoxon's Signed Ranks Sum Test (for inter-group comparisons of salivary mutans streptococci counts). 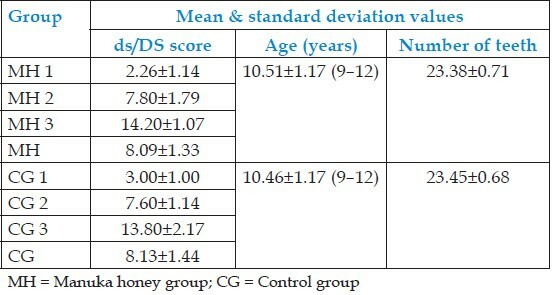 The sample characteristics of the study population are presented in [Table 1]. The mean salivary mutans streptococci counts of both the groups and their subgroups at baseline, day 10, and day 21 are shown in [Table 2]. Comparison of the differences in salivary mutans streptococci levels between baseline and day 10, baseline and day 21, and day 10 and day 21 are presented in [Table 3]. The inter-group comparisons of the salivary mutans streptococci counts at baseline, day 10, and day 21 are presented in [Table 4]. Research has been carried out to determine the effect of honey on the growth of cultures of oral bacteria. One study based on seven species of oral streptococci found that the minimum inhibitory concentration of honey for Streptococcus oralis was 12%, for Streptococcus anginosus was 17%, and for Streptococcus gordonii, Streptococcus mutans, Streptococcus salivarius, Streptococcus sanguis, and Streptococcus sobrinus was 25%, which was the same as the minimum inhibitory concentration of sucrose. Another study also found that the minimum inhibitory concentration of honey for Streptococcus mutans was 25%, and for Streptococcus sobrinus was 35%, which also indicated that there was little, if any, antibacterial action in the honey beyond the osmotic effect of its sugar content. The study did, however, find that the salivary bacterial count was reduced by 40% one hour after holding 5 ml of honey in the mouth for 4 minutes; however, this could have been due to a stimulation of flow of saliva washing away the bacteria. Thus, while only few authors showed awareness of honey having antibacterial properties, none took into account the variance in potency of the antibacterial activity of honey, each study using a single unselected honey. Thus, it is now known that the antibacterial activity is primarily due to hydrogen peroxide formed in a slow-release manner by the enzyme glucose oxidase present in honey, which can vary widely in potency. However, in addition to these, active manuka honey contains non-peroxide antibacterial factors associated with its bioactive phytochemical components (UMF) and is the only honey available for sale (other than its Australian equivalent) that has been tested for its antibacterial activity. , Manuka honey contains D glucono δ-lactone, which reduces its pH and exerts natural antibacterial properties rendering it shelf stable. Its low water activity (0.6-0.75) also renders it uninhabitable to most microbes. Methylglyoxal, the aldehyde form of pyruvic acid, has been identified to be the chief antibacterial compound in manuka honey. Apart from the methylglyoxal content, methyl syringate, ortho-methoxyacetophenone, and 3-phenyl lactic acid have been identified as other abundant components in manuka honey. Methylglyoxal is toxic towards pathogens even at low concentrations interrupting cell divisions, arresting growth, and specifically causing the degradation of bacterial DNA. Thus, it can be expected that, although honey may be cariogenic because of its high content of fermentable sugars, with selected honey that have higher levels of antibacterial activity, there is the potential for harm to the teeth to be reduced by inhibition of the cariogenic bacteria. A recent pilot study by English et al. reported manuka honey with UMF 15 to be highly effective in reducing dental plaque and clinical levels of gingivitis. 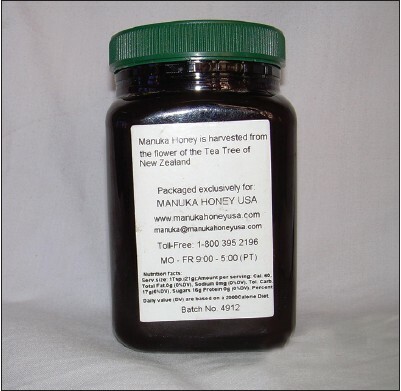 The manuka honey used in the present study had antibacterial activity rated UMF 19.5. Intergroup comparisons revealed that there were no significant differences in salivary mutans streptococci levels between the MH group and the CG (and their respective subgroups) at baseline. This implies that both groups (and their respective subgroups) were statistically equivalent before the start of treatment. It was observed that, after 10 days and 21 days, all MG subgroups showed statistically significant differences over the CG subgroups. Thus, in the present study, the use of manuka honey emerged as an effective adjunctive oral hygiene measure in reducing colony counts. Colonization of tooth surfaces by bacteria is an important etiological factor in most of the common oral diseases, namely dental caries, gingivitis, and destructive periodontal disease. However, it has also been well-established that increased bacterial growth on the tongue is the reason for increased numbers of bacteria in the saliva. The oral surfaces are colonized by over 500 bacterial species and tongue has the largest bacterial load of any oral tissue and makes the greatest contribution to the bacteria found in saliva. Hence, the dorsum of the tongue was also included in the treatment regimen in the MH group. The study subjects were required to keep the honey in the oral cavity for not more than one minute in order to rule out the possibility of salivary bacterial count reductions by stimulation of flow of saliva washing away the bacteria. Since the present study was conducted in a residential school, all participants consumed the same diet during the period of investigation. 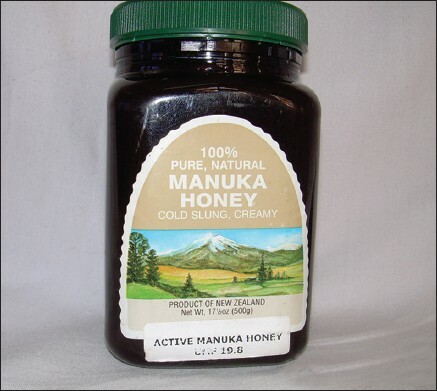 Thus, as diet (an important factor in dental caries) was controlled in the present study, manuka honey was given the best chance of demonstrating its efficacy against Streptococcus mutans. Subjects with either rampant tooth decay (subgroup 3) or very minimal caries activity (subgroup 1) were included in the study, as it was important to see if the protocol remained effective for different baselines of salivary mutans streptococci. Our study was a novel attempt designed to simulate a realistic home regimen in which the subjects used the honey for one minute twice daily while continuing their normal twice-daily tooth brushing routine. In this context, it is noteworthy that the reductions in salivary mutans streptococci in our study occurred in addition to the effects of daily tooth brushing. Since the study was completed without observing any indications of negative effects resulting from the use of manuka honey and was well accepted by the children who participated in the experiment, the honey appears safe for long term oral use. Furthermore, it may be considered worthy of further study for potential applications in the practice of preventive dentistry and dental hygiene. Though the present study demonstrated the efficacy of manuka honey (with antibacterial activity rated UMF 19.5) in reducing the salivary mutans streptococci levels, the degree to which the inhibition of cariogenic bacteria occurs in the oral cavity would have to be determined by feeding experiments. Also, future research directed towards production of candy using honey with high antibacterial activity in place of sugar, may play a potential role in caries prevention, especially in children. The Manuka Honey subgroups (MH 1, MH 2, and MH 3) showed statistically significant reductions in salivary mutans streptococci levels on comparison of the data obtained at baseline, day 10, and day 21. The Control Group subgroups (CG 1, CG 2, and CG 3) did not exhibit any significant reduction in salivary mutans streptococci levels. Thus, in the present study, the use of manuka honey emerged as an effective adjunctive oral hygiene measure in reducing colony counts. Ms. Arularasi Aparna (Microbiologist, Rajah Muthiah Dental College & Hospital) and Dr. Oommen Aju Jacob (Former Principal, Pushpagiri College of Dental Sciences) are thanked for the expertise rendered in the microbiological procedures and for the invaluable suggestions during manuscript preparation respectively. 1. Zumla A, Lulat A. Honey - a remedy rediscovered. J R Soc Med 1989;82:384-5. 2. Molan PC. The antibacterial activity of honey. 1. The nature of the antibacterial activity. Bee World 1992;73:5-28. 3. Rells GK, Nizel AE. Cariogenicity of honey. J Am Dent Assoc 1973;87:29. 4. Shannon IL, Edmonds EJ, Madsen KO. Honey: Sugar content and cariogenicity. ASDC J Dent Child 1979;46:29-33. 5. Wakeman EJ, Smith JK, Zepplin M, Sarles WB, Phillips PH. Microorganisms associated with dental caries in the cotton rat. J Dent Res 1948;27:489-92. 6. König KG. Caries induced in laboratory rats. Post-eruptive effect of sucrose and of bread of different degrees of refinement. Br Dent J 1967;123:585-9. 7. Molan PC. The antibacterial activity of honey. 2. Variation in the potency of the antibacterial activity. Bee World 1992;73:59-76. 8. Allen KL, Molan PC, Reid GM. A survey of antibacterial activity of some New Zealand honeys. J Pharm Pharmacol 1991;43:817-22. 9. Willix DJ, Molan PC, Harfoot CG. A comparison of the sensitivity of wound-infecting species of bacteria to the antibacterial activity of manuka honey and other honey. J Appl Bacteriol 1992;73:388-94. 10. English HK, Pack AR, Molan PC. The effects of manuka honey on plaque and gingivitis: A pilot study. J Int Acad Periodontol 2004;6:63-7. 11. Ismail. Criteria for detection of dental caries. J Dent Res 2004;83:C60. 12. Brambilla E, Garcia-Godoy F, Strohmenger L. Principles of diagnosis and treatment of high-caries-risk subjects. Dent Clin North Am 2000;44:507-40. 13. Gold OG, Jordan HV, Van Houte J. A selective medium for Streptococcus mutans. Arch Oral Biol 1973;18:1357-64. 14. Wan AK, Seow WK, Walsh LJ, Bird PS. Comparison of five selective media for the growth and enumeration of Streptococcus mutans. Aust Dent J 2002;47:21-6. 15. Dustman JH. Antibacterial effect of honey. Apiacta 1979;14:7-11. 16. Somerfield SD. Honey and healing. J R Soc Med 1991;84:179. 17. Tovey FI. Honey and healing. J R Soc Med 1991;84:447. 18. Basson NJ, du Toit IJ, Grobler SR. Antibacterial action of honey on oral streptococci. J Dent Assoc S Afr 1994;49:339-41. 19. Steinberg D, Kaine G, Gedalia I. Antibacterial effect of propolis and honey on oral bacteria. Am J Dent 1996;9:236-9. 20. Sackett WG. Honey as a carrier of intestinal diseases. Bull Colorado State Univ Agric Exp Stn 1919;252:1-18. 21. White JW Jr, Subers MH, Schepartz AI. The identification of inhibine, the antibacterial factor in honey, as hydrogen peroxide and its origin in a honey glucose-oxidase system. Biochem Biophys Acta 1963;73:57-70. 22. Oddo LP, Heard TA, Rodriguez-Malaver A, Perez RA, Fernandez-Muino M, Sancho MT, et al. Composition and antioxidant activity of Trigona cabonaria honey from Australia. J Med Food 2008;11:789-94. 23. Daher S, Gulacar FO. Analysis of phenolic and other aromatic compounds in honey by solid-phase microextraction followed by gas chromatography-mass spectrometry. J Agric Food Chem 2008;56:5775-80. 24. Bhandary S, Chaki S, Mukherjee S, Das S, Mukherjee S, Chaudhri K, et al. Degradation of bacterial DNA by a natural antimicrobial agent with the help of a biomimetic membrane system. Indian J Exp Biol 2012;50:491-6. 25. Putt MS, Kleber CJ, Smith CE. Evaluation of an alum-containing mouthrinse in children for plaque and gingivitis inhibition during 4 weeks of supervised use. Pediatr Dent 1996;18:139-44. 26. 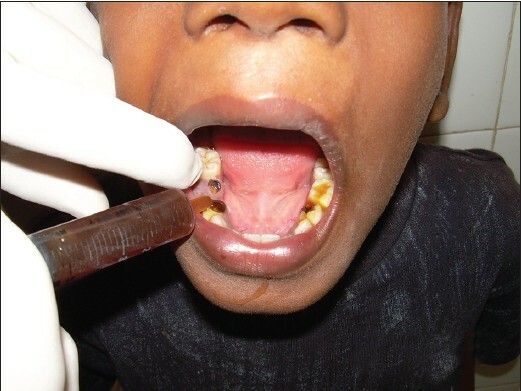 Axelsson P, Kristofferson K, Karlsson R, Bratthall D. A 30-month longitudinal study of the effects of some oral hygiene measures on Streptococcus mutans and approximal dental caries. J Dent Res 1987;66:761-5. 27. Loeshe WJ, Kazor C. Microbiology and treatment of halitosis. Periodontol 2000. 2002;28:256-79. 28. Finn SB. Clinical Pedodontics. 4 th ed. Philadelphia: W. B. Saunders Company; 1999. p. 454-74. 29. Kleber CJ, Putt MS, Smith CE, Gish CW. Effect of supervised use of an alum mouthrinse on dental caries incidence in caries-susceptible children: A pilot study. ASDC J Dent Child 1996;63:393-402. 30. Nancy J, Dorignac G. Lactobacilli from the dentin and saliva in children. J Clin Pediatr Dent 1992;16:107-11. 31. Wyne AH, Guile EE. Caries activity indicators. A review. Indian J Dent Res 1993;4:39-46.